Indeed, the analysis concluded that per capita Medicare spending at the end of life actually declines with age – peaking at $43,353 for those 73 years old and then gradually declining to $33,381 for 85-year-olds and just $27,779 for people 90 and older. The report says that it’s hardly surprising that a “disproportionate share” of Medicare resources goes to beneficiaries at the end of life. Many of those beneficiaries suffer serious illnesses like Alzheimer’s disease, congestive heart failure, kidney problems, cancer and multiple chronic conditions that require inpatient hospitalization, post-acute care and hospice. Yet per capita spending for inpatient services “is lower among decedents in their eighties, nineties, and older than for decedents in their late sixties and seventies, while spending is higher for hospice care among older decedents,” the report states. “These results suggest that providers, patients and their families may be inclined to be more aggressive in treating younger seniors compared to older seniors, perhaps because there is a greater expectation for positive outcomes among those with a longer life expectancy, even those who are seriously ill,” notes the report, which was written by Juliette Cubanksi, Tricia Neuman, Shannon Griffin and Anthony Damico. The analysis included all people 65 and older who automatically qualify for Medicare, as well as some younger people with disabilities or who qualify because of renal disease. More than half of these beneficiaries were 80 or older at the time of the study. From a strictly budgetary standpoint, the beneficiaries who were in the final year of their lives were unique. They received one in every four dollars spent by the health care program while representing just four percent of the overall Medicare population. 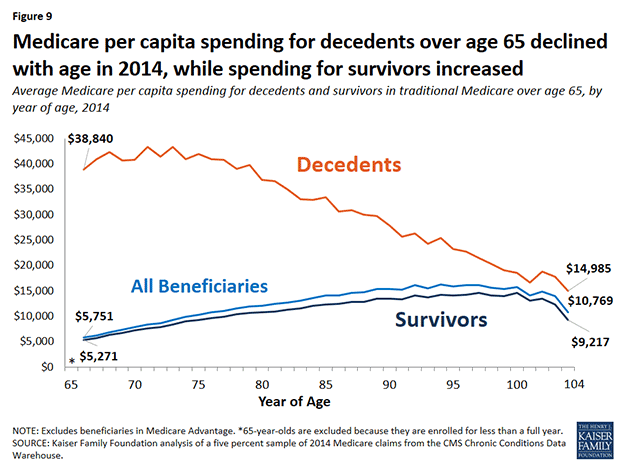 Per capita Medicare spending was nearly four times higher for those who died in 2014 than others who survived -- $34,529 for the decedents to just $9,121 for those who lived. The provision in question would have paid doctors for providing voluntary counseling to Medicare patients about living wills and end of life care alternatives. Palin’s claim was widely debunked, but the provision was dropped from the bill amid rising public concern.